An update from the Half Marathon finish line! The weather may have been glorious, but Sunday 24th March was no run in the park for our group of ten runners who took on the London Landmarks Half Marathon. It was, however, a run through some of the best sights in London! 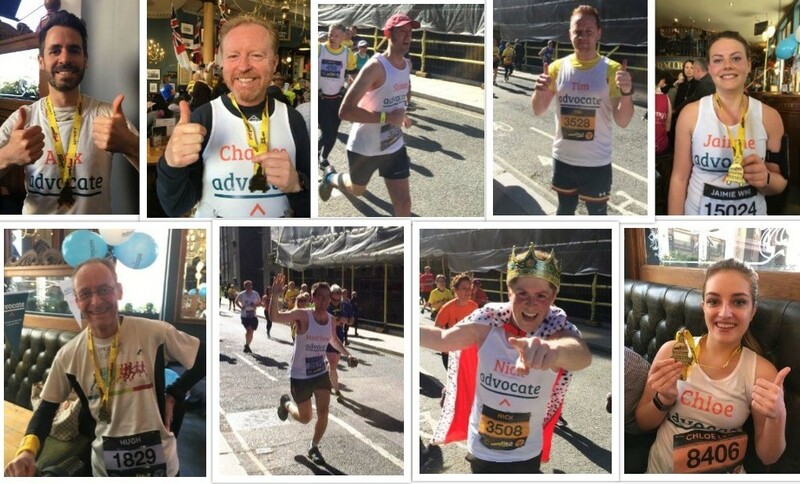 Our fantastic group consisted of Alex Luria, Charles Hale QC, Chloe Lee, Hugh Welch, Jaimie Whiteley, Matthew Lavy, Matthew Fraser, Nick Jelfs, Simon Gledhill and Tim Jones – and all ran to raise vital funds for access to justice and the work of Advocate. Read about how they did below, and sign up for next year! Our fantastic runners on the day, minus a super speedy Matthew Lavy who was too quick for our camera shutter! Advocate would like to give a special mention to fundraising superstar Hugh Welch from Muckle LLP. A keen ultra-marathon runner, Hugh ran his first marathon in Rome in his 50s after having made a bet with his son. Hugh has undertaken many runs since then, but has never fundraised. This year he decided to run for Advocate, and his fantastic efforts telling many clients about the challenge led him to raise more than £5,000, with the total still going up; meaning he has raised over ten times the original target! On top of that, he ran the 13 miles 1:29:08, making him the 153rd man to finish the race out of 5,070. “It's a unique opportunity to do something that I enjoy and also to raise funds for a cause that I really care about i.e. enabling people who can't afford it to have access to justice. Our incredibly committed runners collectively raised over £11,000 to help people get access to justice through our work, more than tripling the original target! Advocate works to help people who are struggling to navigate the justice system on their own by matching them with barristers, ultimately providing legal assistance to those who need it most. We simply wouldn’t be able to help people get the access to justice they need without our amazing supporters. “At a stressful time I have found your organisation and your support a great comfort. It is a fantastic job that you do and one that has the ability to change people's lives for the better - I for one am very pleased that you are there to do the work you do. We want to make sure all applicants have access to justice and the chance to get legal help which can change their lives for the better. Our ten amazing runners have helped to make this possible. If you’d like to follow in their footsteps and take on the London Landmarks Half Marathon 2020 to help fight for access to justice, drop us a line at communications@weareadvocate.org.uk to join the team!